This morning, Sony revealed the newest trailer and details on MLB The Show 18, including new gameplay features. They added the face guards to batting helmets. Saw a lot of post-play celebration in that trailer. Haven't watched the trailer yet just looked at the website and seen the screen shot for franchise mode. I don't know how to feel about it. I like more control but don't know what they mean by less time. Since the screen is of the team traveling in a bus I'm going to just take a guess and say we can pick how our team travels. The joystick on throws looks hard but really good. Saw the legends in the black and yellow striped jersey, who were the light blue team, expansion? Monument Park has a net over it now. I'm hoping the RS+R2 Mechanic is for all the infield, and I hope that Tag up Camera is available in all modes in the regular game. Looks good. I guess I'll be the first "that guy". Meh. It didn't wow me. I think this series would be refreshed 100% if they just redid the player models completely with real cloth physics. That being said, I'll wait for the reviews before buying this year. No pre-order for me (first time ever). Liked the trailer, Loved the blog! Made me excited to see whats in store. Is it just me, or are the Twitch and Gamestop Monday schedules missing from the blog? The 2018 video blog and Twitch livestream schedule can be viewed below. Where is the Twitch schedule in the Blog? Did I miss it somewhere? Can someone post blog schedule? It's not on there. Hopefully they fix it. someone upload the schedule when they can! I'm gonna go ahead and assume that Babe Ruth means classic teams are in. I know they aren't, so no need to tell me I'm wrong. But I'll just go on assumin'. Can someone post the Twitch schedule? I see it was mentioned on the blog, but didnt see the screenshot of it. One small thing for me personally that hope will be updated is the umpires Jerseys as they still have the old ones in this video. Like all early trailers could be old footage so maybe there is some hope that is the reason for the old umpires Jerseys. Hard to put my finger on it but the player models do kind of look improved over 17. Not much else to say at this point this was definitely a big good tease. Can't wait to see and hear about all the new gameplay improvements and features! One last thing is it possible we may finally be getting a true 7th inning stretch? One small thing for me personally that hope will be updated is the umpires Jerseys as they still have the old ones in this video. Like all early trailers could old footage so maybe come hope that is the reason for the old umpires Jerseys. Ramone mentioned in the IGN vidoe that the crowds have AI this year and should react accordingly. he also said you'll see fans talking on their cellphones, drinking from their cups. You'll also actually see fans filing out of the stadium during blowouts. No ceate-a-stadium, no franchise overhaul? Preorder equals March 23 early access at Gamestop. Shop's next to barber and I need a haircut. This is a GAMEPLAY trailer lol. But I wouldn't hold my breath for either given the track record of this game. Franchise mode is stale and flawed with very little improved for several years now. Need to fix the rocket bunts. The other major issue is the base stealing logic is way to over powered towards the runner...it's way to easy to steal bases...particularly third (yes even against a slide step/fastball). Hopefully the animation rework fixes that. I just finished the 20 minute GameSpot video. It seems like the "little things" will be a focus and from the way Ramone hints about presentation and commentary I think there's something good coming. Thats all The Show needs for me. The Show (along with GOW) was the reason I purchased a PS3. I don't have any major gameplay related issues. Looking forward to seeing what else they have done. Looks like Franchise mode may have gotten some upgrades. Wait and see though. Oh the listing for the 22nd. New commentator confirmed? Ok after seeing that I'm real interested to see what's in franchise mode. I'm trying to figure out what is blocked out in the beginning under franchise front office deep dive. I cannot wait for March 13th and 15th!!! Looks like Jim Thome(?) joins the booth? It's more than likely "Phases" which Ramone mentioned in the IGN video. What that is is anyone's guess. I'd guess it's that they added some new logic for the trade deadline and September, maybe even Spring training as well (phases). All much needed, but only if they completely rewrite trade and roster logic. I'm curious about this. Harold Reynolds and Dan Plesac just signed on last year. Plesac has posted tweets confirming he's back and I can't see them replacing HR. So my guess is we are getting a fourth announcer, maybe on a rotating basis like NBA 2K does or a sideline reporter. Another remote possibility could be the addition of a pregame show. Last years schedule had "Front Office" listed as an addition but it was never talked about and obviously not added. Looks like they wanted more time to work on it. I'm interested to see what all it includes. Could be a game changer for franchise mode. I agree. It's weird that Ramone mentioned "Phases" in the IGN video then they released the schedule and yet they still have it censored out. I have no inside info but “Phases” in franchise sounds like an enhanced version of team windows. Like on NBA2K they have the team goal settings for buying/selling/etc that truly affect CPU logic. Hopefully it’s something like that. First time i see the logo on Cubs pants. But the PBR textures on uniforms will change the look of the game. Rendering of colors will more accurate under different lighting conditions. Look at his belt part shining. So ******* ****** ******* goes with the little things deep dive. 3 words, 7 letters-6 letters-7 letters. Things like "rotating interleague schedules" doesn't fit the blanks...neither does "import player into franchise mode." Negative for "expansion relocation ...." and "rainouts doubleheaders..."
I understand this is just a trailer and not in the final stages, just an observation I made. Looking forward to March 23rd! Can't wait to play it! Super pumped about this game. Can't wait to hear more. Yep I'm that guy too. Game looks great and I'm sure it's fun but it just looks like 17 with some polish on it. If you didn't tell me this was 18 you could have told me it was 17 and I'd believe it. Bottom line I, as of this date , see no reason to buy this game. Or at least no reason to pay over $60 to stop playing 17 and to switch to 18. With that said yes I know it's early and there's plenty of time to show more recent builds and convince me so no I'm not writing this one off on first trailer only. Let's all stay tuned I guess. 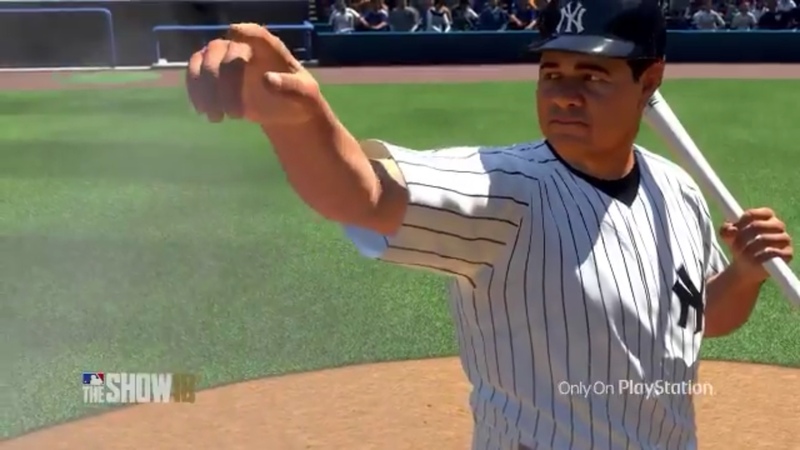 Excited about Babe Ruth and all, but I'm bugged by his player model, because it's just a skinned player model they've been using for many many years now. Specifically, the hand. I think that hand has been used for years. It looks so unnatural and as if it's a freely hanging on the wrist joint with the fingers curled under and the index finger slightly bent. I know it's nitpicking, and if the hitting improves to non superhuman levels I'll be stoked. But for goodness sake, change the dang player models already. They will have to wow me with game play because I'm pretty sure I've seen each and every one of those animations before. Edit: And then I saw that there's a game play trailer on ign most likely addressing all my concerns. well the trailer showed a little teaser of probably RTTS and traveling with the team on a bus. at the 4 second mark. 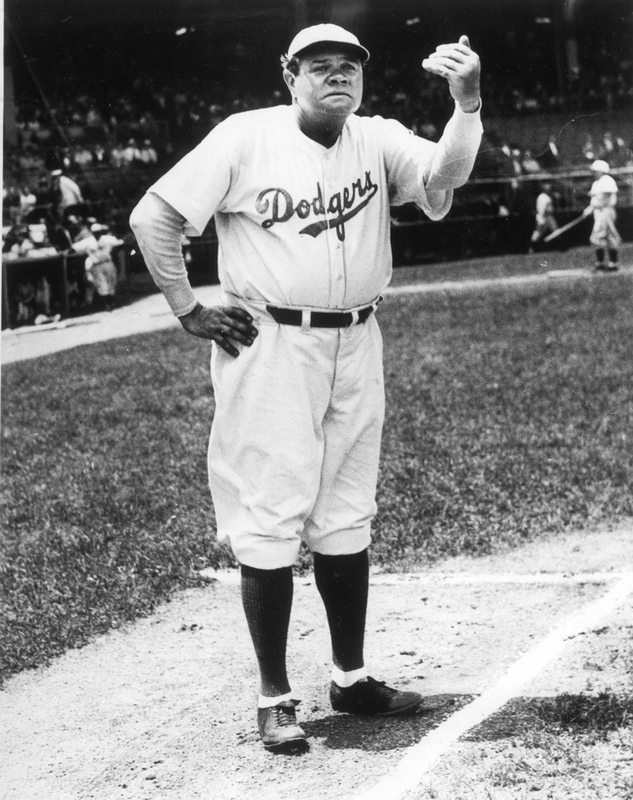 Excited about Babe Ruth and all, but I'm bugged by his player model, because it's just a skinned player model they've been using for many many years now. Specifically, the hand. I think that hand has been used for years. It looks so unnatural and as if it's a freely hanging on the wrist joint with the fingers curled under and the index finger slightly bent.. for goodness sake, change the dang player models already. Trailer did not wow me. Models look okay IDK. It all looks very much the same. We'll have to see how it looks in person. To be honest even I am getting tired of looking at the grass lol. I mean it looks better, but still retains way too much of that terrible shading they have been using for like a decade lol. Why do they insist on the game looking this way? That black shading to the pale grass just does not look right to me at all, and the colors are still way off. I don't know what to think. This game needs a big overhaul in too many areas. That trailer was all yay homeruns and stuff. I don't exactly know. There's something about either the models or animations of the models that still looks pasted together and not very natural, and they seem to not be fundamentally different than they were several years ago. It's hard to describe really but it's a feeling I've gotten since I started playing on PS4. It's like I'm playing a PS3 game that's prettier or something. It's definitely the animations. You are spot on that they are not natural and pasted. Its been that way since the first game on PS3 with no improvement so I doubt it will ever change until there is a changing of the guard. Like there's no weight to the animations? What does that phrase even mean? They're animations created from real people performing the movements in real life (mocap). How do they not have weight? Trying to understand what some folks find fault in year in and year out that I don't. They just done move right, especially at the plate. A great example of how off batter movements are in this video is Goldy, Peralta and Didi. If you watch them in game vs in real life the load and strides arent even close. Goldy has a leg lift in the show, where did they even come up with that since hes never had one. If the guy in the mo-cap suit cant imitate players motions any better than we have gotten over the last 10 years then they need someone new. I think they are referring to momentum. Certain throws give the appearance that it is not a factor even though momentum is a factor in the equation. Yea, momentum is the word. Give us real scaled player bodies, or customization beyond two or three body types. For one. It means rigging motion cap data from a weighted human being to a weightless computer model in a video game isn't perfect. Fair enough. I think there are some game balance issues that go into how fast throws appear to go (like, there might be too many OF assists or runners thrown out from SS hole grounders if throws were real life MLB speeds) and that it's probably done on purpose. But at least I kind of understand where people are coming from now. Not sure exactly where to put this since there was an explosion of different threads today (probably didn't need like 7 or 8 threads for the info drop today...), but I'll have to be honest in that I really didn't perceive that much brand new/different in the 2 minute trailer, the 22 min IGN video, or the 18 min Gamespot video. Factually, I'm sure that I am wrong. Plenty of people noticed a Nike this or that, new legends, a logo on the pants, maybe a new animation, updated scorebug, or a helmet face guard, but I felt like I was basically watching MLB 17 for the most part. For the most part, the players and the gameplay looked the same (didn't see enough tagging to see that the tagging engine is all new, didn't see that much new emoting although Ramone tried to point it out in the IGN video a lot). Visually, I'm not sure how much paint they can add to the build they showed us, but here's to hoping they "crack the code" a few times with coloring, lighting, textures before launch. It's not a bad looking game as is, but it just doesn't look much different to me. They're re-doing skin tones for something like the 3rd year in a row, so maybe there's potential there? I think they'll be able to hit the new tagging system with the stream on Thursday. We'll get to see all those fancy dev widgets in action again and I'm sure they'll set up some tag scenarios to show it off. That is the gameplay stream after all. I love 90% of this. But. The red uniforms still look off to me.. Nats, Angels, and Cards all looked too dark. DBacks were closer to correct because they use a darker shade of red, but still too close to maroon. Ugh. Why is this so difficult? Ramone mentioned in the gameplay/details video (IGN I believe) that they made pitching harder across the board. Was a little disappointed that it looked a lot like 17. I’ve watched two gameplay videos with Ramone and both looked way better than the trailer. That trailer’s probably been done for months. Did they release the video or article that Ramone mentioned in the Gamespot video about a feature they added? Wish they could use some of those camera angles from the trailer to add a bit of variety and freshness to replays and between pitch camera shots instead of the same few that have been there for years. While this should be in the wishlist thread i wish instead of just showing replays of a HR a batter hit in a earlier innings they could show other key moments like a HR saving catch, bases load strikeout, a go ahead rbi double ect. No changes to the sliding animations. That's really disappointing considering they revamped the tag system. I was hoping they'd add more slides or just re-do them to make them more effective. I really hope that guys sliding into bases for absolutely no reason and preventing you from scoring runs is fixed. I can’t believe I still had to fight with guys sliding into third all year long. This. Idk how many times I would hit a ground ball through the infield and my runner that was on 2nd would automatically slide into 3rd when he could score easily. It has cost me games. Same, including what would have been a game winning run in the World Series that I eventually lost. And it happens pretty regularly, too. I hope they got rid of the slomotions during steels or at least give us the option to turn it off. The only way I see this feature working is when the new tagging system is so good that they could zoom it in way more so it’s actually exciting to watch the play. Seems like a solid guess. Would be an admirable "little thing" to add and we saw video evidence that this is in (from the trailer, I think?). Not sure why they'd bleep it out if they already mentioned it, but this seems to be the leader in the clubhouse. Another guess I saw was "rainout double headers" but that would require doubleheaders to be split into 2 words. I've always thought of it as a single word. Not sure if anyone mentioned this, but it still happens to me once in a while on 17 and every game prior: I reach first with a guy who has good speed/steal ratings so the CPU pitches out like 3-4 times. I’m not stealing, but every time my dude slides back into first on the pitch out. Injuries have happened this way to me. Very wishful thinking indeed haha. I hope so too. Disappointed to see the Cardinals were wearing their red hats on the road. I know this doesn’t mean the blue hat isn’t in the game but they don’t seem to be the default road hat. The miss on uniforms is one of the more frustrating aspects of the game to me. Every year it seems to be some piece missing. Now that the Big Bambino makes his appearance it would have been THE opportunity for SCEA to add the old uniform style. Missed opportunity if you ask me, especially since they said they had a big focus on uniforms this year. That's because the red hat is the default road hat as it's been that way in reality for several seasons now. That doesn't mean the navy blue hat isn't in the game. If I'm not mistaken it was in the game last year as the alternate road hat, which is what it truly is. The focus on uniforms was on lighting and textures and adding PBR to them. There are many uniform issues that may not have been addressed. I agree with you that they should have done so but I just wanted to clarify what Ramone said because I think some may be disappointed in their interpretation of what "focusing on uniforms" really means. I'm sure that the large majority of people could care less (hence why they haven't been added), but I would LOVE to see throwback baggy uniforms added. I had a feeling Uniforms we’re going to get a lot of attention this year. Past few years have been Stadiums and Faces, only thing left is Uniforms. But I was hoping for a complete overhaul of cloth physics. Actually baggy pants, tight sleeves, open top buttons, better collision detection between jersey and gut and belt. Same here. It was actually quite disappointing still seeing the belt clipping through jersey fairly often in the new gameplay. Where is Millennium? I love his OS Vids breaking down all the info drops. he did do one, but i think after he did it he continued and played some mlb the show 17 RTTS on his twitch, you just have to check the videos. 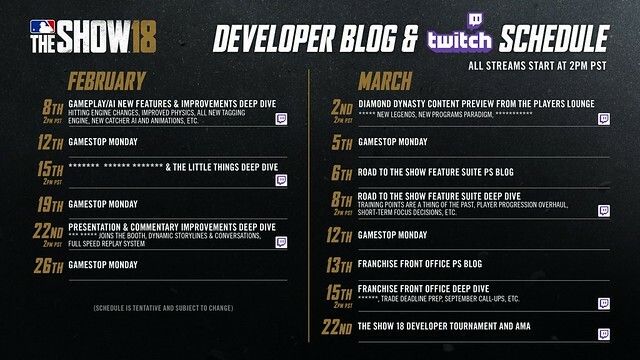 Also he did mention he will be doing break downs after the twitch streams from the devs, like he always does. Sweet, more classic players that are only available for online or arcade mode. You’re right about red is road default except when they play a team that has red as their primary color. That is when they go blue. They did not have the blue road hat in the game last year and that’s why I made that comment. I participated in the alpha and I assume it's now safe to share a few things??? Maybe not. I dunno. I guess all I'll say for now is this trailer looks amazing and I cannot wait. The protective face masks in the alpha looked a bit clunky and did t have any PBR. Hopefully they will refine them a bit before release. It's a little hard to see in the trailer, I had to look at them up close in the alpha. Super glad they're in regardless. I have a few other things, but I do t wanna get in trouble. I would've just posted this in the alpha feedback, but I was oddly never able to access that forum. Anyone else in the alpha feel that way about the masks? I also felt ball physics were a bit exaggerated in the alpha. I have more feedback, but couldn’t access the alpha forum as stated before. Anybody know now that first pitch weekend (March 23) has been expanded to Walmart etc. will walmart still require a pre-order? Or can I just walk in at like midnight and pick one up on the spot. Has this been addressed?